i managed to spend the entire day on the phone... it's amazing how many businesses answer with a recording! awesome news though, i'm all booked and ready to head to Vegas for Cosmoprof :D i also got my new doctor and my mom's Tivo set up... yep, i'm feeling productive! 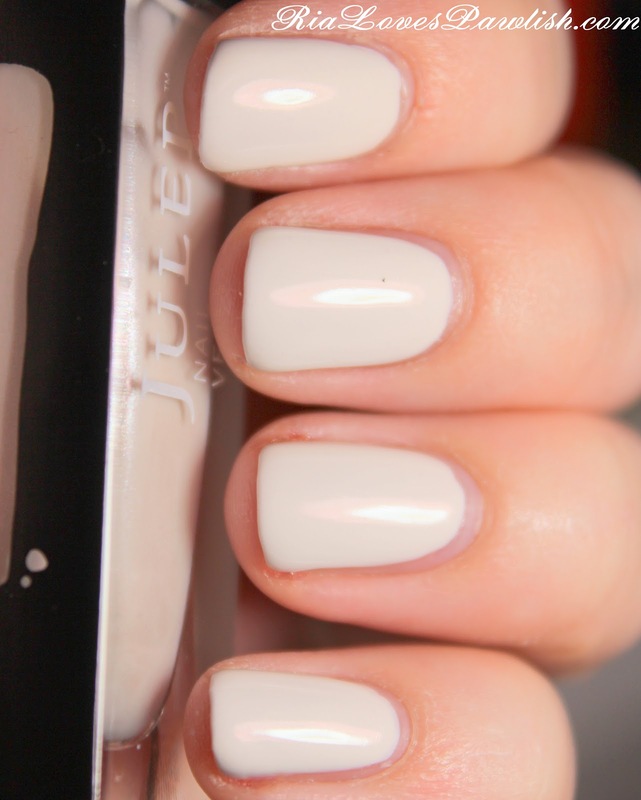 today we are checking out Julep Kate, a white creme. in the bottle it has a pearlescent effect in the bottle, but *sadly* it really doesn't translate to the nail. if you really eyeball it, you can see it slightly in bright light... but it'll never be noticeable. the white isn't a bright white, it's quite muted and leans ever slightly beige. the formula is not the best... i used two coats on most fingers, but the polish is somehow gloopy and runny at the same time... use a gentle hand! it's definitely not my favorite white, and the formula makes a pass in my book. one coat Orly Nailtrition, two coats Kate, one coat Seche Vite.